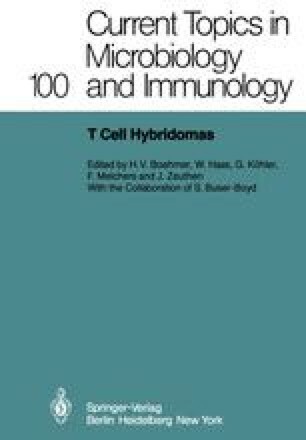 Long-term cultures of murine T cell lines and clones are available which recognize influenza virus in conjunction with self-H-2 antigens and which help B cells to respond to influenza virus and to a “bystander” antigen such as sheep erythrocytes (SRC) (1,2) by replication and antibody secretion (W.G. and F.M., manuscript in preparation). Continuous culture of these lines requires repeated stimulation by antigen and histocompatible spleen cells or by T cell growth factor (TCGF). Such T cell lines and clones are useful to study the molecular nature of the antigen- and H-2-recognizing T cell receptors and of the molecules which mediate specific interactions between T cells and macrophages, and T cells and B cells (3,4). However, to obtain larger quantities of T cell receptors it would be advantageous to have the expression of such molecules “immortalized” in T cell hybridomas. Furthermore, if such T cell hybridomas would also immortalize the functions of T cell lines to help B cell responses, they could then be used to study cellular cooperations of T cells with macrophages and B cells.